The Satanic Temple protested at the Arkansas State Capitol, demanding the statue of the Ten Commandments be removed from the capitol grounds and be replaced with a statue of the devil, which they happened to have on hand. “If you’re going to have one religious monument up then it should be open to others, and if you don’t agree with that then let’s just not have any at all,” said Satanic Arkansas co-founder Ivy Forrester. According to Wikipedia, Baphomet is a Sabbatic Goat, created by Eliphas Levi in the 19th century. Sabbatic is defined as of, relating to, or appropriate to the Sabbath as a day of rest and religious observance. The Satanists want a monument that mentions the biblical Sabbath removed if they cannot promote their religion (which does not advocate actually keeping of the seventh-day Sabbath). In a hypocritical move authorities on December 19, 2015 allowed the Satanic Temple to preform a religious ceremony on the State Capital steps of Lansing Michigan. 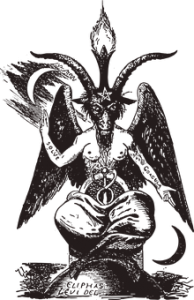 The Satanic Temple is accepting donations to assist our efforts to challenge arbitrary, insulting, and outright harmful regulations imposed on women who seek abortions. Since there are a lot of abortion supporters, this could be one reason some are promoting The Satanic Temple. To embrace the name Satan is to embrace rational inquiry removed from supernaturalism and archaic tradition-based superstitions. The Satanist should actively work to hone critical thinking and exercise reasonable agnosticism in all things. Our beliefs must be malleable to the best current scientific understandings of the material world — never the reverse. The Satanic Temple holds to the basic premise that undue suffering is bad, and that which reduces suffering is good. We do not believe in symbolic “evil.” We embrace blasphemy as a legitimate expression of personal independence from counter-productive traditional norms. Of course by promoting blasphemy and abortion and opposing the Ten Commandments, the Satanic Temple is promoting evil. Did mega-Protestant Pastor Andy Stanley really say you should not use Old Testament prophecies to support Jesus’ Messiahship? Did he also claim that there was no Bible until the fourth century? Did he also teach against the Ten Commandments? Did Jesus, Peter, Paul, Apollos, and Philip use Old Testament prophecies to prove that Jesus was the Messiah? Did it really take until the fourth century to have a Bible? Did early Christians teach the observance of the Ten Commandments? Dr. Thiel, who listened to Andy Stanley in a podcast, plus has studied the Bible and church history, answers these questions from a Christian perspective. The USA is becoming more accepting of many things that go directly against the Bible. Blatantly promoting satanism is just one more. Promoting satanism is wrong (cf. Isaiah 47:13-15; John 8:44; 2 Corinthians 11:12-15). And it is not just the blatant Satanists that do that as Andy Stanley, to cite one example, shows. The Bible warns that God will send punishment “against an hypocritical nation” (Isaiah 10:6, KJV). Teachings against the Ten Commandments and the promotion of satanism are only part of the MANY wrong and hypocritical practices in the USA. Does Astrology Work? Many believe and follow astrology–but does it work? Here is a link to the article in Mandarin Chinese: S`fg/QÆxnTÿ. The Occult Explosion – What Does It Mean? A booklet by Herbert W. Armstrong which also includes a challenge. Did Early Christians Celebrate Birthdays? Did you know that Satanists are big believers in promoting birthdays? Did biblical era Jews celebrate birthdays? Who originally celebrated birthdays? When did many that profess Christ begin birthday celebrations? A related sermon video is available and is titled: Birthdays, Christians, and December 25th. Walpurgis Night: Witches’ Sabbath? This is observed in parts of Europe April 30th-May 1st. Though named after a Catholic saint, it tends to be like Halloween. The History of Early Christianity Are you aware that what most people believe is not what truly happened to the true Christian church? Do you know where the early church was based? Do you know what were the doctrines of the early church?Is your faith really based upon the truth or compromise? This entry was posted on Wednesday, August 22nd, 2018 at 3:00 pm	and is filed under Religious News. Birthdays: A connection to Satanism?